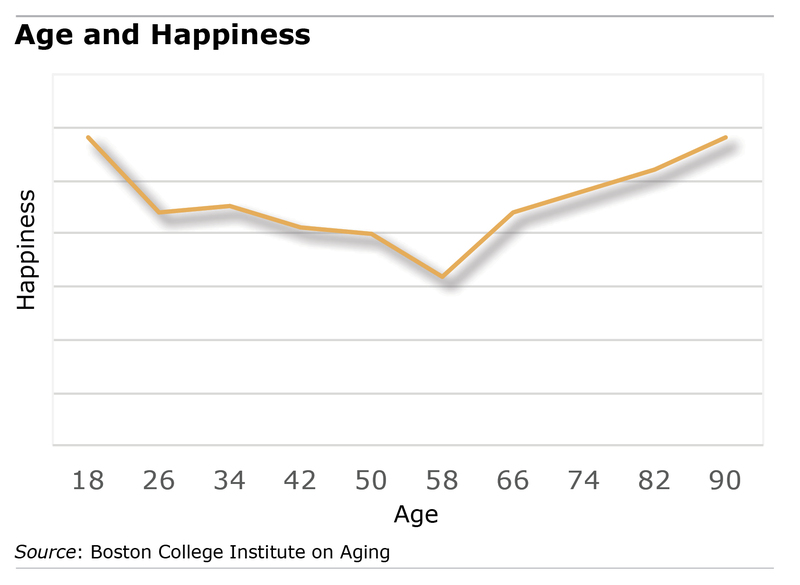 Around age 58, people start getting happier. That’s what the research shows, and this blogger can attest to it. In the new video displayed below, Rocio Calvo, a Boston College professor of social work, offers up theories for the happiness phenomenon – financial security is one. She also has some particularly striking “happiness statistics” on Hispanics and immigrants. All over Boston College, academics are studying aging issues, which complement the financial and economic research turned out by the Center for Retirement Research, which sponsors this blog. Calvo’s video is part of a series of videos by the multidisciplinary Institute on Aging at Boston College. It’s interesting viewing for older people and their families, with apologies for the regression table (the significance of which quickly becomes clear if you stick with it). Some events are beyond our control and we need to deal with the circumstances that impact our lives, sometimes causing stress that can’t be ignored. There are times though that we reap what we have sown earlier. The research held that gratitude stimulates feelings of happiness. I attended an event with Khizer Khan. He is articulate, as you probably know and his dignity is not only graceful. It moves us all. There is another side of him that did not come through in his speech at the Democratic Convention. He expressed gratitude for some much in his life. Perhaps we should take a cue from him. As a cultural anthropologist (who lived outside the U.S. for years), I find that Americans seem to lack, or at least downplay, feelings of gratitude. We are quick to critique, but slow to be grateful for things that come into our world. Perhaps we should reconsider that frame of mind. If we find things in our life for which we are grateful, native born Americans become happy earlier (before age 58) in life. A shift toward gratitude might help us to appreciate more now, as well as the many years of our longevity. One reason for our (my husband and I) happiness is that we have reared our children and they are productive adults. We enjoy our grandchildren but their day-to-day care is not our responsibility, although we do the occasional babysitting. Being thankful improves my life. I try to create a daily list, nature, contacts, surprises, and as the list grows so does my feeling of wellbeing. At night the list is reviewed and added to, usually. Gratitude really pulls everything together, even if the day brings with it a snafu of some sort. The Atlantic published an article on the happiness “U-curve” a few years ago that provides some additional background on this topic. So according to the study, I am 3 years away from true happiness. When I was younger, I always wondered, why do older people not seem scared to grow old, seeing that death is closer than ever?